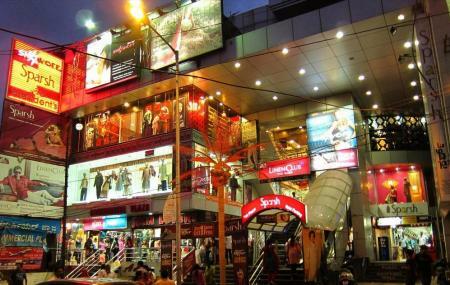 Commercial street in Bangalore is best known to people who love to shop. This is one of the most famous street markets in Bangalore known for its jewellery and antique stores, book shops, apparel outlets and accessory stalls. Located near MG Road, this street is a frequent haunt of locals as well as travellers. While you explore the meandering alleys around the market, you’ll also get to try street food from its food vendors. Don’t forget to haggle here though! How popular is Commercial Street? People normally club together Iskcon Bangalore, Sri Sri Lakshmi Narasimha Temple and Ub Tower while planning their visit to Commercial Street. It is a really nice place to shop..Especially for travel addicts who wants cheap stuff. Its located near mg road metro so nearest metrostation is that. It has really nice street food good transporation services cheap but medium quality goods too. Great shopping destination. Its a heaven for shopaholic girls. Along with brands, there are local shops which sells good quality factory outlets at a reasonable price. Clothes, fancy jewelries, handbags, footwear are available. Good place for shopping. Many shops, many brands , always get offers, parking place is available in walkable distance. Take care of belongings and ornaments while you walk through the street. May shops where you can bargain. Crowded place, best place for shopping but better to avoid during festival time or weekends!